Pupil + Corneal Reflection and Pupil only tracking modes. 500 Hz binocular eye tracking. 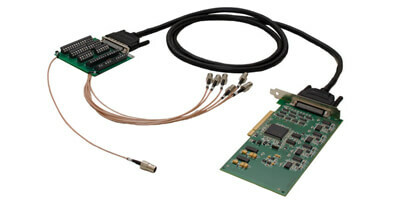 Access to eye position data with 3.0 msec delay. High quality computer based or scene camera eye tracking. Fast and simple participant setup, calibration, and validation. 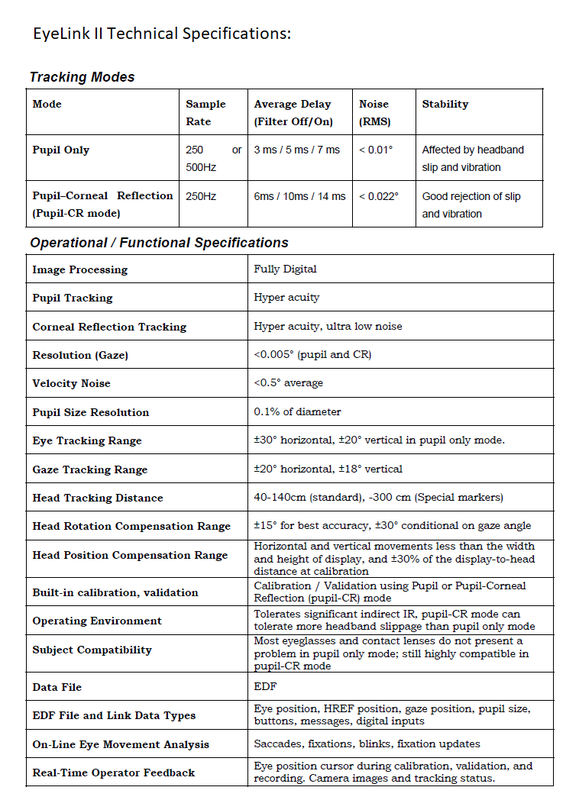 With the addition of the EyeLink II Scene Camera option, the EyeLink II can also be used for real-world eye-tracking applications that are not tied to a computer monitor. Three miniature cameras mounted on a comfortable padded headband. No mirrors, making it very robust and easy to set up. Two eye cameras, which allow binocular eye tracking or easy selection of the subject’s dominant eye without any mechanical reconfiguration. An optical head-tracking camera integrated into the headband, which allows accurate tracking of the subject’s point of gaze without the need for a bite bar. 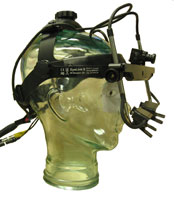 Gaze position is provided on video from a forward facing head-mounted camera. The scene camera has a 250 Hz sampling rate. It has excellent tolerance to external / varying light sources. Binocular recording is used to correct for horizontal and vertical parallax errors when the participant is looking at non calibrated viewing distances. It has a compact / portable / battery powered Host-PC for research outside of the lab. 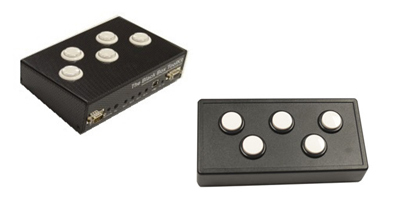 The Black Box ToolKit Response Pad (left) and the Millikey Button Box (right) are both millisecond accurate. 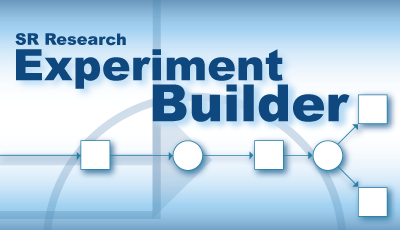 Experiment Builder is a sophisticated and intuitive graphical programming environment for creating computer-based psychology and neuroscience experiments. It runs under Windows and macOS (OSX). 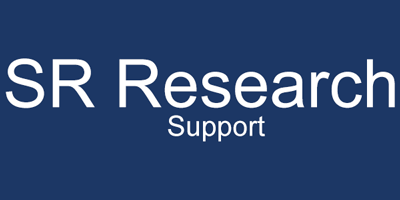 There are hundreds of existing templates that can be easily modified (e.g., change blindness, smooth pursuit, pro-saccade task, Stroop task, etc.). 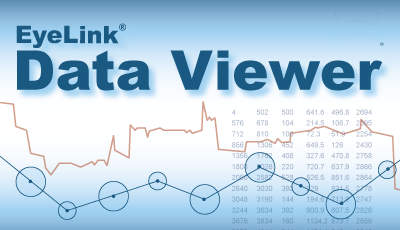 Data Viewer is powerful and intuitive software for viewing, filtering, and processing gaze data recorded with EyeLink eye trackers. Use it to create static and dynamic interest areas, heatmaps, and output hundreds of dependent measures such as Dwell Time, Sacccade Onset, etc. 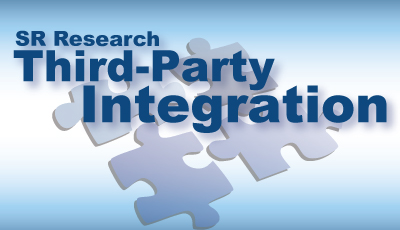 Data Viewer is highly integrated with SR Research Experiment Builder, E-Prime, Presentation and any custom programming method.